Ace Attorney uses simple displays, making navigation a no-brainer. 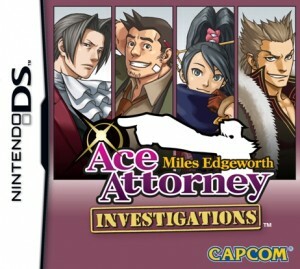 It follows the simple designs of the previous Ace Attorney series, so it should be familiar to fans of the series. The game also introduces a third person view, making the entire areas visible, as well as increasing the users navigation. Save functions can be accessed simply through the start button, and can be accessed mostly anytime throughout the game. The major downside, which has been noted throughout the series, is that the unlimited save functions makes the game far more easier, due to the fact that you can just reload the save if you mess up at a specific junction. Thus, it nullifies the importance of game-time decisions made in the game. Load time between game segments and scenes varied throughout playing, as some events took a bit to load up. Text speed also varied throughout, as some dialog went too fast and some too slow (this doesn’t take into account for certain dialogs that were set to this for the purpose of storytelling). Game’s graphics seemed a step up from previous installments, as they seemed crisper. Details for level are done well, as they make the environment more three-dimensional. Spites for the game are a bit shoddy, but are not a bother in game. Text layout is the same for the previous games, but there are some misspellings and color overlay with some of the background, due to the transparent text box. Sounds consist of some new tracks, as well as one re-hashed from previous games in the series. The game music brought more suspense and drama to the game, which adds value to the game. It also had the occasional “Objection!” sound bits, which will really please the fan base. While the game elements have changed, as in playing in third-person, it definitely should not scare away long time players of the series. Even out of the courtroom, it still retained the testimonial game that was in the previous incarnations. The addition of the “logic” function was really a nice addition to the series, as it made you think on how evidence and testimonials linked together. It was a nice melding of old and new mechanics and still made the game engaging. The game itself has about 5 chapters, all of them are about easy-medium difficulty. Game length is a decent while, probably will take you over a good 15-20 hours to play through. Once you play through it, you have the option to go through the chapters you’ve completed if your feeling to play them again. Other than that, there is really strong argument can be made in saying that this game has any replay value. While a great game, once you play it, your done. Ace Attorney Investigations: Miles Edgeworth is a game that breathes some life back into the series, and does so without the spiky-hair hero, Phoenix Wright. While the formula of the game has stayed mostly the same, it is without a doubt that the Ace Attorney game can still make a quality game. So, my verdict? Guilty on all counts…for being a great game. Court is adjourned. The Good: New game mechanics flow well, long & engaging story. The Bad: Text sometimes mesh with background, no text speed option, transition between certain scenes uneven. This entry was posted	on Thursday, April 15th, 2010 at 11:45 AM	and is filed under . You can follow any responses to this entry through the RSS 2.0 feed. You can leave a response, or trackback from your own site.